Vintage Staffordshire blue and white stripe cup and saucer. In very good condition with no chips, cracks or crazing. The cup has a height of 7.5cm and a top diameter of 8.5cm. The saucer has a diameter of 14cm. Please see other listings - happy to combine postage. Please contact me before paying for postage quote. Many thanks for looking. Tea Cup and Saucer. The saucer 5 3/4" across. 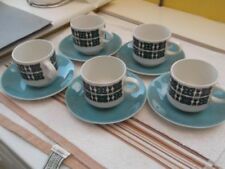 2 x Vintage Retro Kilncraft Bacchus Cups and Saucers Good Condition. Mostly very good used condition. One chip on one tea plate and another with a wear mark (as per pics) but all others are in good condition. Just been stored in a cupboard for years and need to clear it out. Shiny blue glaze. Unused were cabinet bound. Saucers 5.1/2" or 14cm. This lot is for a set of 3 Retro 1960s Tea/ Coffee Cup and Saucers by 'Barbeque' By Barratts these are a 1960's design in a very lustrous green, an almost glass type finish and celtic style details to the plates and cup. 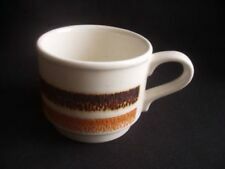 Trio of cup, saucer & side plate in the iconic Fiesta pattern by Barker Bros Pottery in Staffordshire. Design is kitchen utensils highlighted in blue on a white background. Fiesta Pattern - White & Blue. Balmoral Pattern. Elizabethan Staffordshire Cabinet Cup & Saucer. This is a beautiful Staffordshire Duo Tea Set with a beautiful fruit print gold gilding. It comprises a cup and Saucer. The cup is 8cm wide and 7.5cm high. The saucer is 14cm. I do have another matching Duo listed. Boxed tea and coffee set by Kiln Craft. Otherwise all is in great condition. Mustard/Gold in Colour with Bacchus Pattern. Excellent Used Condition. Sorry but I cannot accept foreign cheques/checks/money orders. as any problems can usually be sorted out amicably. Crown Trent / Staffs. Fine Bone China. Back stamp an Aynesly and Co. Back stamp Aynesly. 2 blue English Ironstone plates 24cm. Country house with horse and rider in foreground. Cup and saucer A1173. Mustard/Gold in Colour with Bacchus Pattern. Delicate Victorian "ASBURY" Bone China Cup and Saucer, it's very old, very pretty floral pattern "LIVADIA" to cup in green and continues to inner of cup. 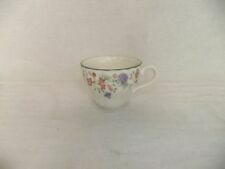 Victorian Asbury Longton Bone China Tea Cup and Saucer. Pretty scalloped edging. Churchill Group acquired Myott Potteries in 1991 and continued production of their more popular patterns; these pieces have a similar shape and scalloped edging to the Myott version but the cup handles are very slightly different and the blue colour tends to be a little deeper. Side plates 6 of 18cm. Brentleigh Ware Staffordshire. 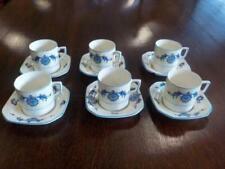 3 x Tea Cups and Saucer Plates. Apple Blossom. Apple Blossom design by Brentleigh, Staffordshire, England. Art Deco from 1940's - 50's. 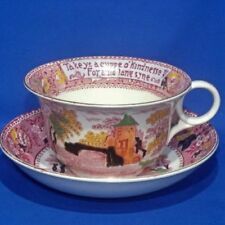 This beautifully decorated tea cup & saucer from Royal Chelsea is in a. BEAUTIFUL FRUIT PATTERN. 1st quality item. Churchill Ports of Call - Morocco tea cup and saucer.